You’ve probably heard about the Meltdown and Spectre CPU security flaws that are making headlines around the world. So, if you’re looking to protect your device from these issues, you’ve come to the right place. Many companies, such as Microsoft and Apple, have released updates to their software to help mitigate Meltdown and Spectre - though a full fix for these issues could still be some way off. If you're worried your PC may be affected, you could try Ashampoo's Spectre and Meltdown checker, which will check your system quickly and easily and will inform you if it is. If so, read on to find out how you can protect yourself against the Meltdown and Spectre CPU security flaws. As new revelations are still emerging, we’ll keep this guide up to date as any new fixes for Meltdown and Spectre are found. To get up to speed on the issue, check out our news on the critical bug in Intel CPUs, as well as Intel’s response. 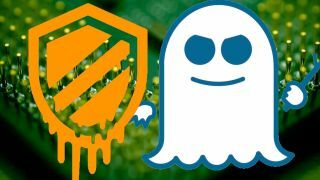 Spectre and Meltdown are the names of the flaws found in a number of processors from Intel, ARM and AMD that could allow hackers to access passwords, encryption keys and other private information from open applications. The flaws, found by a number of people including a member of Google’s Project Zero, are sending shock waves through the IT world. Namely, it was revealed that they had been present in chip designs for over 20 years, and that they affect a number of companies’ processors, meaning the flaws could be found on a huge number of devices, from PCs to web servers and even smartphones. Should I be worried about Spectre and Meltdown? At the moment, you shouldn’t panic too much, because so far it doesn’t look like the Spectre or Meltdown flaws have been used in an attack, and device manufacturers are working with Intel, ARM and AMD to fix these flaws. Below you’ll find ways to fix and protect yourself against the Meltdown and Spectre CPU security flaws for a range of devices. We’ll keep updating this list as new fixes emerge. Google will release a new security update on January 5 that will help protect your Android Phone against Meltdown and Spectre. If you have a Google-branded phone, such as the Nexus 5X or the Pixel 2 or Pixel 2 XL, then you should get the update promptly, and on Google’s newer devices the update should download and install automatically. though, hopefully due to the attention Meltdown and Spectre are getting, most manufacturers won’t take too long to implement the update. Open the settings app on your Android smartphone, go to ‘System’ and see if you can find new updates waiting for you. It may also be worth following your phone manufacturer on Twitter to keep up with news about the update. Apple has finally broken its silence over Meltdown and Spectre, revealing that all iPhones are affected by the security flaws. While the delay in admitting the flaws were indeed affecting its products was frustrating, Apple did reveal that it had already released ‘mitigations’ for Meltdown in iOS 11.2, so make sure you keep an eye out for any new updates made available for iOS on your iPhone or iPad, and go into 'Settings' to check what version of iOS you are running. Apple has also released iOS 11.2.2 which you should download and install immediately. Go to Settings > General > Software Update and download any update that's waiting for you. Windows PCs are likely to be hit hardest by Meltdown and Spectre, regardless if they run on Intel or AMD processors. The good news is that Microsoft seems to be on the case and has said that it has already released a security update on Wednesday for Windows 10, as well as previous versions of Windows. Windows 10 should download the update automatically, but to be sure, type ‘windows update’ in the search bar of the taskbar, and select ‘Check for updates.’ Download and install any new updates it finds. Macs have also been affected by Meltdown and Spectre, and while Apple was initially keeping tight lipped about the problem, it finally released a statement saying that all Macs have been affected. While this is worrying news, Apple also added that it has already released a series of fixes in macOS 10.13.2, so keep an eye out in the Mac App Store for any updates to OS X or macOS, and make sure you’re running the latest version of the operating system. If you have a recent Chromebook, then you should be automatically protected from Meltdown and Spectre, as Google released Chrome OS version 63 in December, which has features included to avoid these flaws. If you want to know if your Chromebook is updated to version 63, or if an update is coming, check out Google’s list of Chrome OS devices, and check that it says ‘yes’ in the last column.